Reckoned for its adventurous activities, Andaman is abounded with islands that are enclosed by the coastal waters. The Scuba diving activity is popular amongst the tourists of Andaman. One of the specialties of Andaman is that the underwater formations and coral reefs are untouched by the human activity. If you are traveling to Andaman for Scuba diving, then you should definitely go for some of the best spots like lighthouse point, and other diving sites with ample of big fish action. Moreover, you can visit the north island that is an amazing diving site with coral mounds and hard corals. At Global Andaman Tour & Travels, we are engaged in organizing exceptional Scuba diving tours for the travelers, in and around Port Blair (Andaman and Nicobar Island, India). We ensure that by availing our services you will get the safest diving experience. Visit Andaman for Scuba diving in the months of December-April. Are you planning an adventurous tour to Andaman with your friends or family? If the answer is yes, then avail the best services from Global Andaman Tour & Travels. Andaman Island offers numerous adventurous water sports to its travelers amongst which the most preferred one is jet skiing. You can go for this sport activity in a pleasant weather, as jet skiing can be dangerous due to heavy downpour or stormy weather. 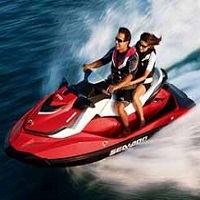 We organize Jet skiing adventure tour at the Water sports complex in Marina Park and Corbynâ��s Cove Beach. So, feel free to contact us anytime. We are based in Port Blair (Andaman and Nicobar Island, India). 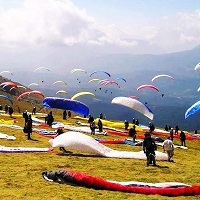 Apart from jet skiing, other popular and adventurous sport activities include parasailing. This activity is most preferred by the non-swimmers, as it is a conglomeration of air and water adventure. When you go for parasailing, the trainer ties you behind a motor boat and harnesses you with a parachute. When the boat speeds off into the water, you fly off at its back like a kite. Most Indian and foreign tourists come to Andaman for experiencing this thrilling activity. If you want to experience parasailing in the best manner, then contact Global Andaman Tour & Travel for organizing it perfectly for you. We are based in Port Blair (Andaman and Nicobar Island, India). Often dream of walking on sea? Well, Global Andaman Tour & Travels is here to fulfill your dreams of sea walking by rendering exceptional services. Travelers from different places visit Andaman for experiencing the fun sport activity of sea walking. The activity trainer will give you a helmet that will enable you to get close-up view of the sea without any disturbance. 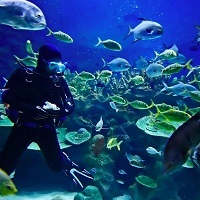 It will allow you to experience the underwater world closely. You do not have to handle any equipment or need any experience for this activity. Therefore, sea walking is one of the most preferred and enjoyed water activities in Havelock Island. For getting a perfectly organized sea walking tour, come directly to us. We are based in Port Blair (Andaman and Nicobar Island, India). If you want to experience the underwater world like a fish, then snorkeling is a water sport you can go for. At Andaman Island, you can experience the underwater coral structures and shallow reef areas by signing up for a snorkeling activity. For this activity, you can visit any beach in Andaman including Red Skin Island, Havelock Island, Wandoor, Mahatma Gandhi Marine National Park, Jolly Buoy Island, North Bay, Corbynâ��s Cove Beach, and several others. These beaches offer various activities such as snorkeling, surfing, some other water activities. 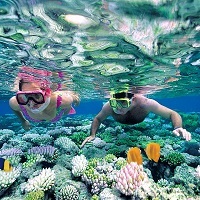 The best time to go for the snorkeling activity is during the mornings. For a perfectly organized snorkeling activity, you need to contact Global Andaman Tour & Travels that is based in Port Blair (Andaman and Nicobar Island, India).